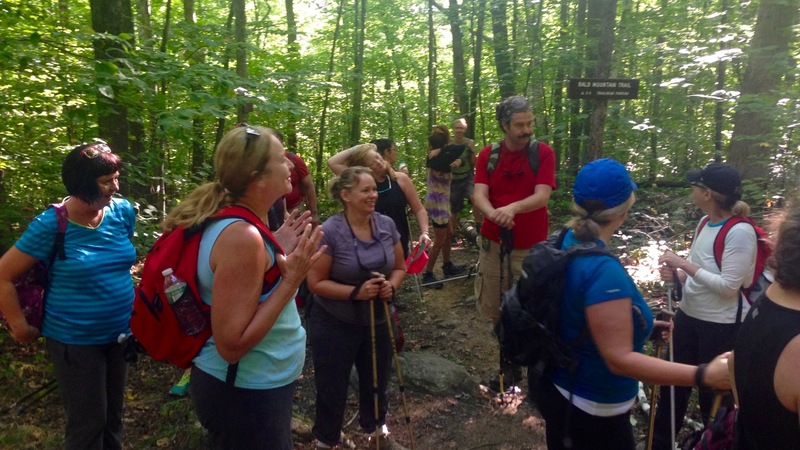 It’s been six months since I visited New Life Hiking Spa, and it feels just like yesterday – which explains why I keep sharing this Killington, Vermont, gem with hiking and fitness friends across the country. Created in 1978 by fitness pioneer Jimmy LeSage, New Life is an affordable and authentic experience for guests who appreciate the outdoors – without having to spend a lot of money. New Life doesn’t try to impress by pretending to be anything it isn’t. Instead, it focuses on what it does best: providing guests with a comfortable and inviting atmosphere to enjoy great hiking, fun group exercise and healthy cuisine, and lose weight in the process. If you love to hike, this is the place for you. Jimmy created the program to take advantage of the best hiking (and weather) from 9 am to 12 noon. Each morning, guests choose from three levels that accommodate all fitness levels: nature walk, intermediate and advanced. Each group then heads off in their respective vans for a variety of interesting and unique hikes in the Green Mountains. Though I’ve hiked before, I found the intermediate group very comfortable, allowing me to go ahead with the lead group or hang behind at a more relaxing pace. Each hike includes a break for water and fruit, and a chance to rest. Stretching is an important part of the program, and all hikes start and finish with guided stretches. Once back at the resort (and you still have the energy), New Life offers a variety of exercise classes throughout the afternoon, including yoga, Pilates, qigong and Zumba. Other amenities include a saltwater swimming pool, hot tub, games room and lounge. And finally, when your muscles say “enough is enough,” you can head to the spa for a variety of massages. One massage or reflexology service is included for each three-night stay and additional services are priced at $75 to $90 per hour. The lodge at New Life is an older property with character. Accommodations are on the European side (read: smaller), but clean and comfortable with air conditioning and a private bath. Rooms on the second floor have peaked roofs and small balconies. After a day of hiking and exercise, it was a relief to sit down to nutritious home-cooked meals with vegetarian options. Don’t forget to try the breakfast quiche! While New Life doesn’t offer an official breakdown of nutritional information, the food plan is about 1,600 calories a day. The hotel does serve coffee and tea. New for the 2016 season, guests can now enjoy a glass of beer of wine in a new lounge on the other side of the hotel that also offers live guitar music a few nights a week. The staff at New Life is absolutely wonderful. From guides and instructors to staff in the dining room and hotel, Jimmy and his wife Kathleen have created something very special. New Life Hiking Spa’s season runs from May 12 to October 3. Do yourself a favor and make plans to visit in 2016!